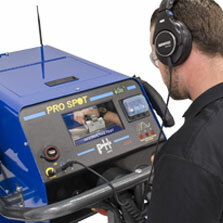 The i4s Smart Spot Welder features all the things technicians love about the i4 and more. Built in training provides technicians immediate resources to get the job done faster than ever. 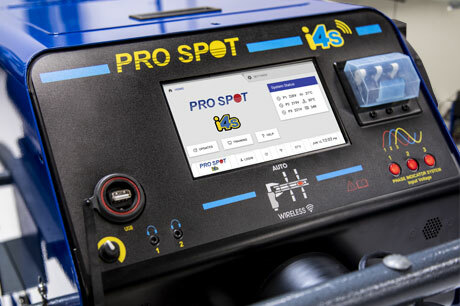 With our Wifi connectivity, you will receive automatic updates from Pro Spot and weld log reporting via email. Using continuous feedback information, the i4s quickly gathers and adjusts to the weld as its occurring, providing accurate & proper welds. Save time by clearing alerts or changing parameters directly with the on-gun display screen and fingertip controls. There is no need to go back and forth from the vehicle to the welder. The new i4s Gun comes with 360 degree Arm Rotation providing technicians more maneuverability where access space on the car is limited. Staying connected is easier than ever with the i4s’ built-in Wifi, which allows users to connect directly and quickly to access training videos, materials, and OEM procedures. With built-in speakers, headphone jacks and a high-resolution display, training delivery has never been easier. The i4s can quickly communicate Email Weld Logs in real-time with the press of a button to meet the increasing demands from OEMs, insurance companies, and certification programs. Set & Assign Work Orders on the welder to any technician to help maintain records and monitor workflow. At the press of a button, the i4s measures the thickness of the metals automatically using the latest optical technology. The i4s senses the metals to be welded from a pre-delivered current to determine the type of metal. The i4s features a new cable-gun. Based on the thickness and resistance feedback information, the i4s delivers the correct weld power every time, regardless of type of metal or thickness. 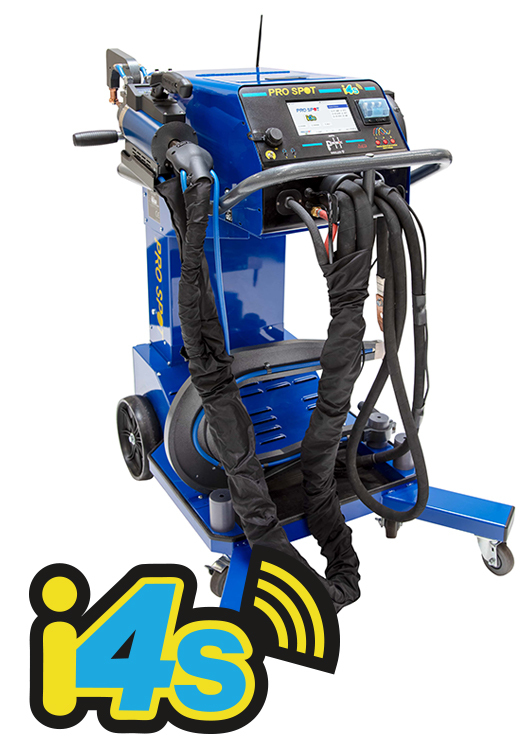 The i4s features an all-new, advanced welding gun with an on-gun display screen that allows instant feedback on every weld performed. The new i4s gun, with 360-degree arm rotation, also has fingertip controls allowing the user to change settings without needing to return to the machine every time they need to adjust weld parameters. The technician can freely move throughout the vehicle repair process in a fast and efficient manner. With built-in WIFI, the i4s now allows users to instantly connect with Pro Spot for the latest software updates, training videos and content. Servicing your equipment is easier than ever before, instantly share information with Pro Spot for quick and easy troubleshooting. This feature helps eliminate guesswork and downtime so that shops can remain productive and profitable. Staying connected is easier than ever with the i4s’ built-in Wifi, which allows users to connect directly and quickly to access training videos, materials and OEM procedures. 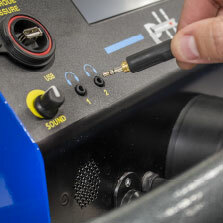 This wireless connection also gives users the ability to export weld logs to meet the increasing demands from OEMs, insurance companies and certification programs. Easily export logs to the email of your choice or directly to a USB drive. Train directly on the machine with onboard training videos and files. The i4s has built-in headphone jacks and speakers to help with training. It doesn't matter if it's a loud shop environment or quite space, plug in or turn up the volume for the speakers to start training instantly.